Archie Comics has worked hard in the last few years to make its name synonymous with, of all genres, horror: from the shambling undead of Afterlife with Archie to the macabre witchcraft of The Chilling Adventures of Sabrina and most recently the hirsute carnage of Jughead: The Hunger. Even Archie’s wildly popular Riverdale television adaptation takes an unusually dark approach to the stereotypically sunny residents of Archie’s all-American past, earning frequent comparisons to Twin Peaks. 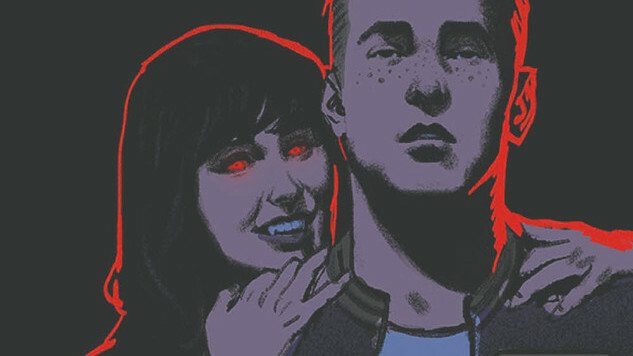 The next Archie/arch-fiend mash-up making its way to shelves is Vampironica, created by the brother/sister team of Megan and Greg Smallwood, the latter of whom regularly appears on our favorite cover roundups. In the Smallwoods’ capable hands, Riverdale resident Veronica finds herself saddled with sanguine desires…and powerful new abilities. In advance of the series debut in March, Paste exchanged emails with the siblings to discuss their horror influences, where Veronica falls on the sparkly-to-feral vampire spectrum and the powerful draw of the dark side. We’ve also got an exclusive first look at issue two’s covers from Greg Smallwood, Sabrina artist Robert Hack and fan-favorite Afterlife with Archie artist Francesco Francavilla. Paste Magazine: I wanted to start with something you mention in the initial press release, that becoming a vampire actually helps humanize Veronica. Is it the brush with mortality that comes with having your blood drained, or do petty romantic problems and high-school rivalries just not carry as much weight when you’re undead? Megan Smallwood: Becoming a vampire definitely puts life into perspective for Veronica, but don’t start underestimating her undeniable knack for flair and drama. She’s the self-appointed queen of Riverdale High, so romantic problems and high school rivalries are always going to be a part of Veronica, but now they’re just one aspect. Turning into a vampire overnight just adds to the drama. I like to think that becoming a vampire just creates a more multifaceted Veronica. Paste Magazine: Veronica is typically paired with Betty when not in an Archie-centric story. Does Betty have a significant role to play in Vampironica, or are you purposefully moving away from that dynamic? What about everyone’s favorite redhead? Greg Smallwood: Betty plays a pretty significant role in Jughead: The Hunger, so Meg and I chose to focus on Veronica and a few characters who aren’t as present in the other Archie Horror books. Archie and Betty are important to the story but they’re taking a backseat to Veronica’s story. In Veronica’s world, it’s all about Veronica and I think it’s appropriate that her comic follows that same principle. Paste Magazine: The horror side of Archie Comics has expanded from zombies to witches to werewolves and now vampires. Beyond the pun-tastic title, what drew you to bloodsuckers? Do you connect more with romantic, stylish vampires or the vicious, monstrous iterations? Greg Smallwood: Meg and I both love horror and we both love Archie comics so we could have been enticed by any pairing of the two. Having said that, vampire mythology gives Meg and I lots of room to tell a story. Most monster horror has its natural limitations but vampires can work with many different genres and tones. And although the rules of a vampire are fairly defined, audiences are open to creators breaking those rules as long as it makes for a great story. That’s a fantastic starting point to work from. Megan Smallwood: I think we both like the idea of battling the monster within, which is one of the scariest aspects of vampires. Vampires are insidious because of their ability to maintain this human facade, which a lot of monsters don’t have the ability to do. Greg Smallwood: I’ve always been attracted to a mix of both vicious and stylish. I’m not interested in stories where vampires are equivalent to brainless zombies but I’m equally uninterested in soap operas that just happen to feature vampires. I like to have a balance between the gothic romance and the evil brutality. Paste Magazine: You cite Fright Night and An American Werewolf in London as inspirations for Vampironica, both classics known for cutting terror with black humor. What other genre touchstones influence your approach? Are you both big horror buffs? Megan Smallwood: I think Bram Stoker’s Dracula best evokes the eerie treacherousness we envision for Vampironica, because vampires don’t go “bump in the night.” You don’t see them coming if they don’t want you to. Greg Smallwood: Meg and I both read Dracula when we were younger and that left a lasting impression on me. When I think of vampires, I think of Dracula. So when it came time to establish our own vampire rules for Vampironica, we went back to the original. We’ve dispensed with a lot of modern rules, like bursting into flames if exposed to sunlight, and shied away from trying to explain vampirism scientifically. We’ve taken a few liberties but we’re sticking with a lot of the rules Stoker established. Paste Magazine: Greg, you recently delighted your Twitter followers with designs for a team of supernatural Marvel characters. Do you find yourself creatively drawn to the darker corners of comic storytelling? Greg Smallwood: I like the gravitas and seriousness that you find in horror. Most postmodern storytelling likes to paint the world gray with the line between heroes and villains blurred. I’m drawn to comics like Midnight Sons and Vampironica because it’s an opportunity to tell a story about good vs. evil with clear lines drawn between the two. I like lighthearted fun comics as much as anybody but when it comes time to sit down and create my own, I naturally go dark and serious. As funny as Vampironica can be at times, it’s still probably the most serious of the Archie Horror comics. Paste Magazine: Family collaborators are pretty rare in comics. What’s your creative dynamic like? Do you think knowing each other so well makes the process smoother, or does it give you the leeway to really go in on each other over creative disagreements? Greg Smallwood: Knowing each other well definitely makes the process smoother. Meg and I have a shorthand that we can use to communicate ideas that might otherwise be difficult to explain to someone else. And creative disagreements become easier because neither one of us are afraid to hurt each other’s feelings. If one of us comes up with a bad or mediocre idea, the other one can shoot it down without worrying about tact. It’s quite refreshing. Greg Smallwood: The first story arc is basically an origin story. There’s a tiny bit of the superhero genre working itself into the story and that’s mainly due to the abilities Veronica gains being a vampire. Unlike other curses, vampirism comes with a lot of really helpful side effects—immortality, enhanced strength, heightened senses—and that gives Veronica the classic Peter Parker choice: Does she accept responsibility and use her powers for good or does she reject responsibility and use her powers for personal gain? The first arc answers that question.